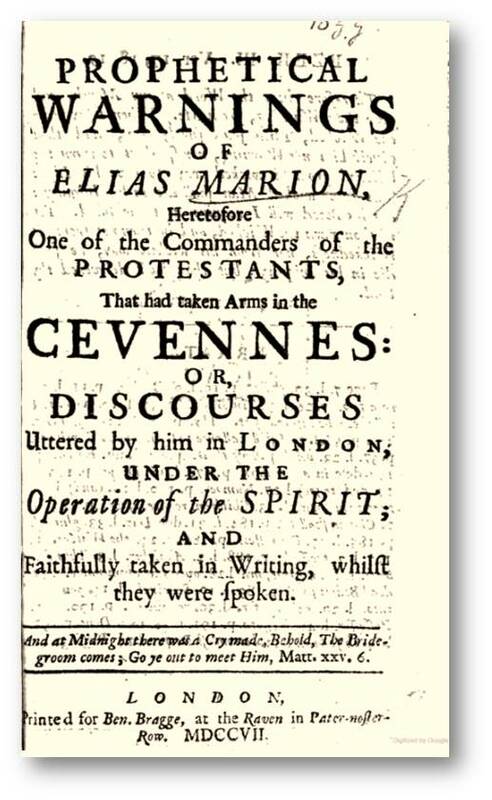 The original "French Prophets" were three exiles from the Camisard conflict, Durant Fage, Jean Cavalier and Elie Marion, who arrived in London in the course of 1706. Marion, at the age of twenty-eight, was the oldest and most influential of the trio. A one-time law clerk from Toulouse, he had first been inspired in 1703. He had served as a captain in "Colonel" Cavalier's Camisard army and followed his chief into exile. After a brief stay in Switzerland in 1704, he had participated in a short-lived incursion into the Midi organised but barely supported by the English and Dutch. After a second defeat, he returned to Lausanne where he was about to take up employment when he "was stopped by the Spirit of God which changed in an instant the dispositions" of his heart. On 22 July 1706, in the presence of his sister and father, God spoke through his mouth, instructing him to "quit worldly establishments" and go to England. He arrived on 16 September. The other two prophets, Fage and Cavalier shortly preceded him and had already begun to deliver divinely inspired pronouncements. The town houses of London were clearly a world away from the open-air gatherings of the Cévennes. Despite the violent convulsions and agitations which accompanied the manifestations of the Holy Spirit, the meetings themselves soon took on an ordered and settled structure. There was a new concern with accuracy and verification: it became standard practice for pairs of "scribes" to transcribe the words of the prophets and compare notes. Additional rituals developed, such as the bestowal of "Prophetic Blessings" by the laying-on of hands. In June 1707 John Lacy rented premises on Bridgewater Square in the Barbican to serve as an officially licensed meeting house. 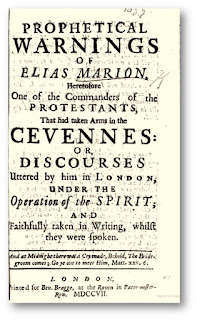 The Prophets thus rapidly took on the character of a sect, with organised retreats, the preparation of publications and the system of blessings all serving to encourage group cohesion; by mid-1707 they began to establish a significant following outside London and In late 1708 an elaborate structure based on the tribes of Israel was adopted. In its later years, however, the community became less close and was frequently beset by dissension. .
Not surprisingly, the French Protestant church in London, well-to-do and conformist, looked upon the new arrivals with suspicion. 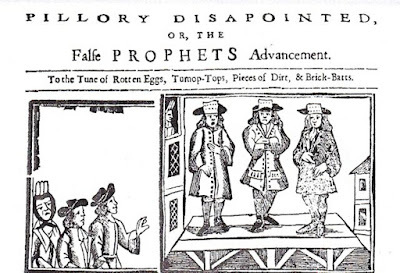 In January 1707, following a series of interviews, the Soho consistory declared that the Prophets' trances were feigned and that their prophecies contained “nothing new but the grimaces”. At the end of March 1707, at the suggestion of the bishop of London, it was ruled that the Prophets should be denied communion in Huguenot churches. French followers were therefore forced to choose between the Prophets and their church. The most general Sign that all and every one of them have, is that of Shaking; some less and some more. And this the Spirit has explain'd to us, to be the Sign of what he is now going to do: what he has foretold in his Word, and what they are sent before to warn of, to wit, he is coming to shake terribly the Earth: to shake not only the Earth, but the Heaven also; and to make the Heralds of the Sinners to shake and tremble [An Answer to Several Treatises .. on the Subject of the Prophets (1708) p.43]. In some cases the enactments went much further and closely resembled the Jansenist tableaux vivants of the 1730s. Nor did they take place entirely behind closed doors: Prophets were seen with with a wooden yoke about their necks, or walking with bare buttocks to signify kings lying down naked to signify the humiliation of kings. Pamphleteers noted with particular relish the Prophetess who ran naked to the altar of the Sardininian chapel in Duke Street and declaimed there for fifteen minutes. 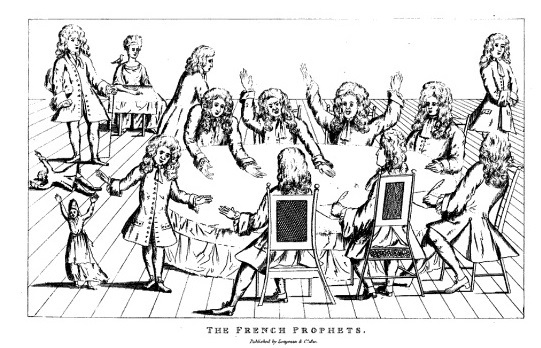 In May 1707, at the instigation of the Soho consistory, Marion, and his "scribes", Daudé and Fatio de Duillier, appeared before Chief Justice Holt in Queen’s Bench Court accused of publishing prophecies filled with blasphemy and sedition. In the warrant, Marion was described as a pseudo-prophet, "an abominable, detestable and diabolical blasphemer, a disturber of the peace, heretic and impostor, publisher of false, scandalous and seditious libels" (See Schwartz, p. 84). The trial did not finally conclude until November, when the trio were found guilty and sentenced to stand in the pillory on two successive days. As gentlemen, Daudé and Fatio were ceremonially relieved of their swords. On 1st December they stood for an hour at Charing Cross with notices on their hats detailing their crimes. The Duke of Ormond instructed law officers to keep the crowd within bounds as Fatio had once been tutor to his brother, the Earl of Arran. The next day, despite the cordon of guards, the crowd managed to spit on Marion and Daudé, and cover both with ordure. Marion was slightly wounded in the face. Sustained by a growing sense of martyrdom to the cause, they accepted the sentence with "a joyful air, which corresponded to the liberty and contentment of our hearts"(Schwartz, p.109). 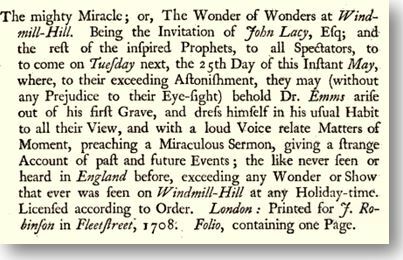 Shortly before Christmas 1707 the group suffered a second setback when the chemist and prophet Thomas Emes, fell ill and died. This represented a spiritual crisis for believers who expected that they would all live to serve in Christ's Kingdom. Despite the fact that Lacy had not managed to cure Emes when he was alive, the faithful were soon swept up with the promise of a far greater miracle - Emes's resurrection from the dead. There were several weeks of meetings and theatrical pronouncements, in which the initiative tended to gravitate to the younger, less cautious prophets. Four out of six of the prime movers were English, the principal actors being John Potter and the twelve-year-old Anna Maria King. Potter elaborated an extreme scenario, in which Emes would emerge from his grave sitting up, "more fat, and more fair than every he has been before" In a climactic meeting Potter specified the date: 25th May - one month above the number of days that Lazarus was in the grave. The rash claim took place against a background of growing concern about unfulfilled prophecies. Despite Lacy's caution, a number of specific predictions had escaped his lips: in July 1707 Lacy himself had prophesied "a terrible overthrow of Buildings in this City" and that "the Tower Guns will roar for a few days before this day seven-night". It was always possible to explain away failure by reinterpreting prophecies as metaphorical or by claiming, as did the chemist Timothy Byfield, that God might withhold a promised miracle because of the onlookers' lack of faith . 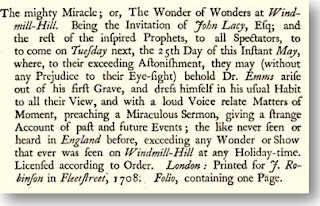 Nonetheless by the end of October 1707 Lacy had been goaded into predicting a timescale of six months for the appearance of a decisive miracle. The resurrection of Emes thus became a testing point of faith, even though Marion was not involved and Lacy himself, though designated by Potter to perform the resurrection, was hesitant in his published pronouncements. Meanwhile, the atmosphere of expectation continued to mount. The faithful were sustained by predictions from Mary Beer of worldwide spiritual conquest and for the first time a sustained missionary effort was begun outside London. 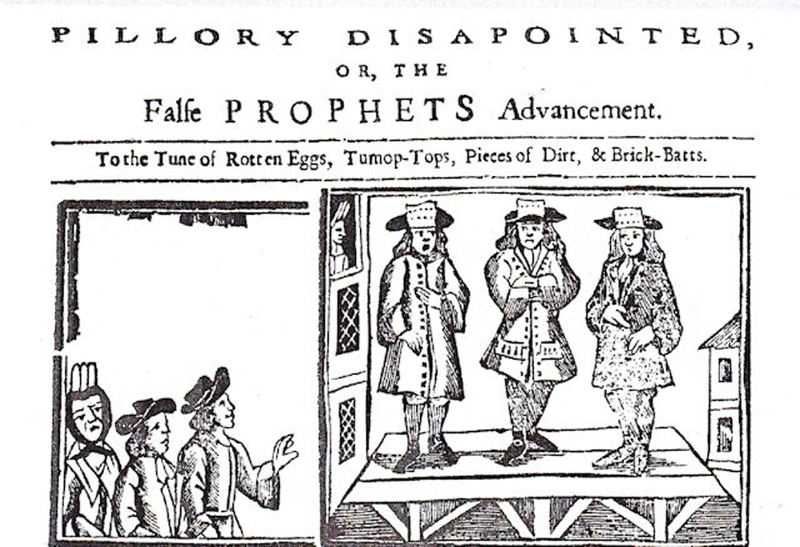 There were successes in Colchester and Ipswich, though a mass rally in Enfield provoked such hostility that the prophets found themselves arrested for inciting a riot. In London portents abounded. In March came news that the Old Pretender had sailed for Scotland. Thunder crashed over the city and it there were prophecies that "fire and brimstone should be poured from heaven" on Lady Day (25th March). A famine was predicted; and families of believers went to great expense and trouble to stock their larders. Text of a hostile broadsheet announcing the resurrection of Dr Emes. The 25th May, the day of the promised resurrection was a public holiday. 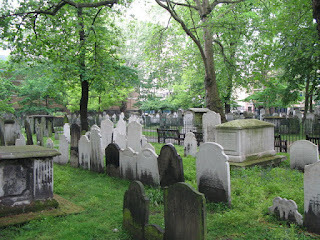 Crowds converged on the burial ground in Bunhill Fields, where magistrates had posted two trained bands in anticipation. One estimate put the crowd as high as 20.000. They were, of course, disappointed. Lacy absented himself later claiming that the atmosphere of violence had been unpropitious for the miracle. 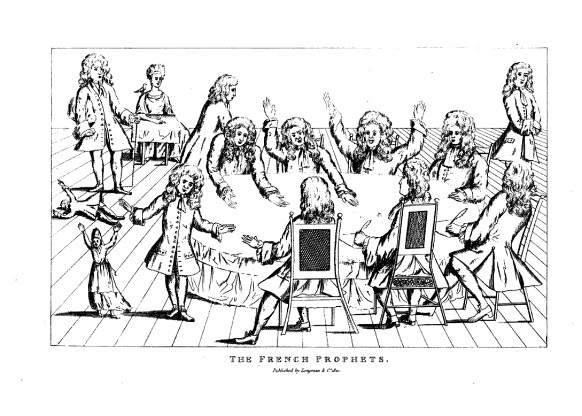 Hillel Schwartz, The French Prophets: The History of a Millenarian Group in Eighteenth-Century England. University of California Press, 1980.